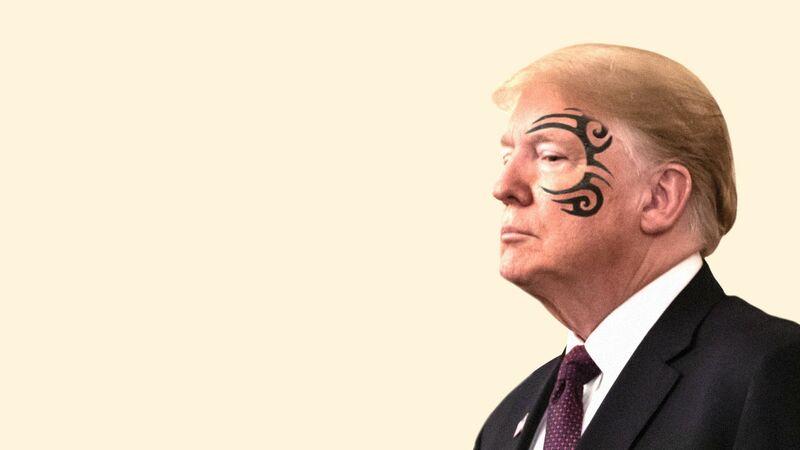 "Everybody has a plan until they get punched in the mouth," Trump said, echoing a famous Tyson quote. Jonathan Swan had asked the adviser whether Trump ever expressed frustration that his West Wing lacked enough of a plan for the crises ahead. Despite President Trump's lack of personal interest in the planning, the White House Counsel’s Office is now moving fast to prepare for the twin threats of Robert Mueller and the new Democratic House majority, Jonathan Swan reports. These threats dwarf anything that any president has faced since Bill Clinton. There's a surge of internal action after a slow start: Planning for Democratic oversight only began in earnest at the senior level in November. Much of the mid-level White House staff remains oblivious to what’s going on behind the scenes. But the new White House Counsel, Pat Cipollone, has impressed the officials he's dealt with and Republican legal eminences Swan has spoken to. The official told Swan there's "aggressive lobbying" to convince Flood to stay on beyond Mueller. Former New Jersey governor Chris Christie settles scores in "Let Me Finish," a memoir out Jan. 29 from Hachette Books, writing that President Trump "trusts people he shouldn’t, including some of the people who are closest to him." Christie asserts that Trump has a "revolving door of deeply flawed individuals — amateurs, grifters, weaklings, convicted and unconvicted felons — who were hustled into jobs they were never suited for, sometimes seemingly without so much as a background check via Google or Wikipedia." 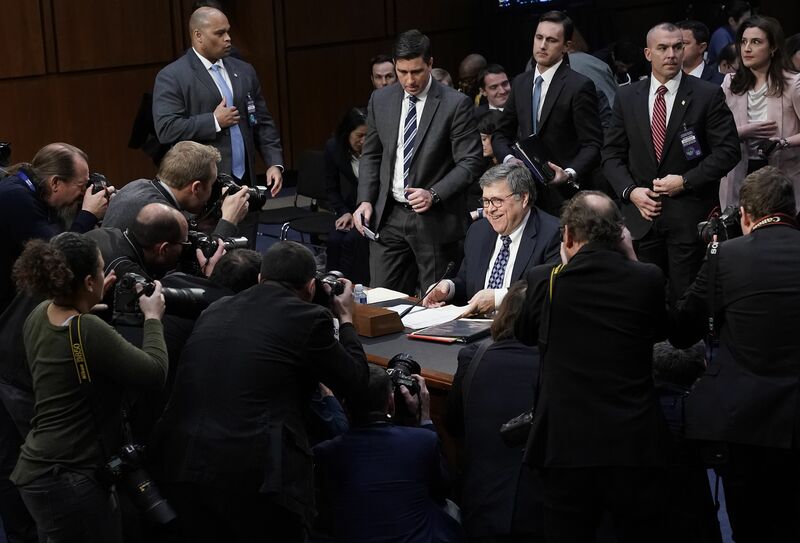 "Attorney general nominee William P. Barr suggested ... that any report written by special counsel Robert S. Mueller III might not be made public," per the WashPost. "Barr said Trump asked him about Mueller’s integrity. 'I said Bob was a straight shooter and should be dealt with as such.'" 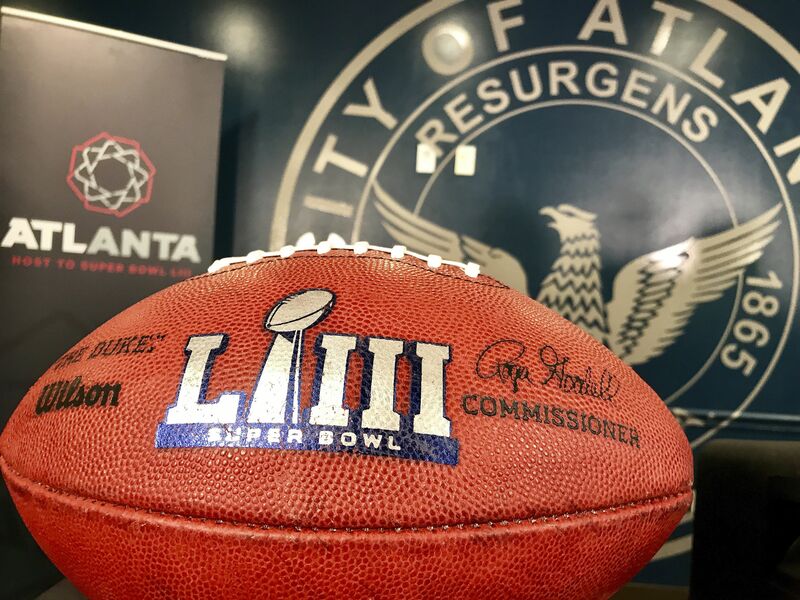 "A day after travelers waited nearly 90 minutes in snail-speed security lines at the world's busiest airport, Atlanta's mayor is concerned about the waits that could result when the city hosts the 2019 Super Bowl," AP's Jeff Martin reports. "The ongoing partial government shutdown is 'uncharted territory' amid planning for one of the world's biggest sporting events, Mayor Keisha Lance Bottoms said." "The expected crush of travelers is significantly more than normal. On a typical day, 60,000 to 80,000 passengers are screened at Atlanta's airport. ... On Feb. 4, the day Bottoms calls 'Mass Exodus Monday,' about 110,000 passengers are expected to be departing ... one day after the Super Bowl." The state of play: The Washington Post headlines, "The shutdown threatens the promise of government jobs — and a way of life"
P.S. ... "The partial government shutdown is inflicting far greater damage on the United States economy than previously estimated, the White House acknowledged on Tuesday," reports the New York Times. "President Trump’s economists doubled projections of how much economic growth is being lost each week the standoff with Democrats continues." "The analysis, and other projections from outside the White House, suggests that the shutdown has already weighed significantly on growth and could ultimately push the United States economy into a contraction." After reaching a record-breaking number of 14,542 migrant children in its custody last month, the Department of Health and Human Services has managed to release more than 3,500 children, according to data collected by the Associated Press from individual HHS migrant child shelters, writes Axios' Stef Kight. Prime Minister Theresa May’s historic defeat in the House of Commons yesterday has emboldened those in Westminster and around the country who argue a second referendum is needed to decide whether the U.K. goes ahead with Brexit or reverses course, Axios World editor David Lawler writes. A second referendum now looks at least as likely as the other scenarios: a tweaked version of May’s deal, a softer Brexit, a “no deal” exit or a general election. 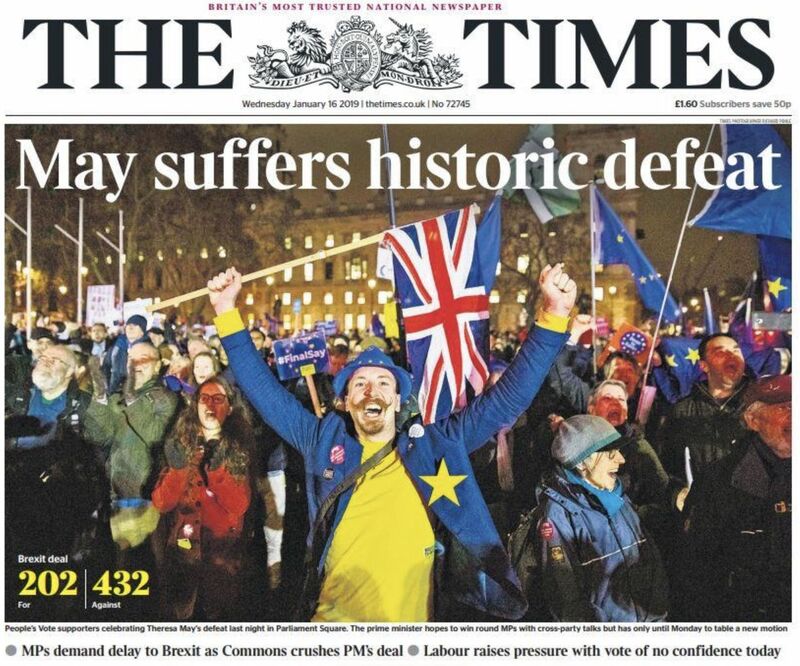 The timing: Brexit Day, March 29, is fast approaching. “A fair estimate is that the whole process would take a minimum of 21 weeks, but this would be much shorter than other recent referendums,” the Institute for Government notes. "It's an important first step, and it's one I am taking because I am going to run," the New York senator said on "The Late Show." "She listed a series of issues she'd tackle as president, including better health care for families, stronger public schools and more accessible job training." "Colbert presented Gillibrand with a basket of campaign gifts, including an ear of yellow corn to wave in Iowa, a piece of granite for New Hampshire and a one-of-a-kind button that reads 'I announced on the Late Show with Stephen Colbert.'" "Gillibrand, 52, ... plans to campaign in Iowa over the weekend." "Pelosi lobbied for other members to join the panel over Rice, leaving the third-term New York Democrat off a list of her preferred members for the committee during a tense closed-door meeting Tuesday night." "The push by Pelosi was seen as payback by many in the room after Rice was one of the main megaphones behind a campaign to block [her] from becoming speaker again." "New York members ... were still upset that another member of their delegation, freshman Rep. Anthony Brindisi, was blocked from getting on the Armed Services Committee on Monday night." "Brindisi, one of nearly two dozen freshmen Democrats in districts won by President Donald Trump, was also a Pelosi critic on the campaign trail." He voted for Joe Biden for speaker. U.S. companies — desperate for workers despite the threat of recession — are lowering the qualifications they've previously demanded of new employees, writes Axios future editor Steve LeVine. But they are finding that many long-term jobless Americans first require training and help in the very basics — getting to work, doing so on time, and paying for any required uniforms. What's happening: Cities across the U.S. are stepping in with "life and employment skills" classes and assistance for Americans who have been left out of the economy — former convicts, ex-drug addicts, and others at the fringes. "But there could be a human watching from behind its cartoonish googly eyes." "Badger Technologies CEO Tim Rowland says its camera-equipped robots stop after detecting a potential spill. But to make sure, humans working in a control center in the Philippines review the imagery before triggering a cleanup message over the loudspeaker." "25 of the robots are now operating at certain Giant, Martin's and Stop & Shop stores, with 30 more arriving each week." 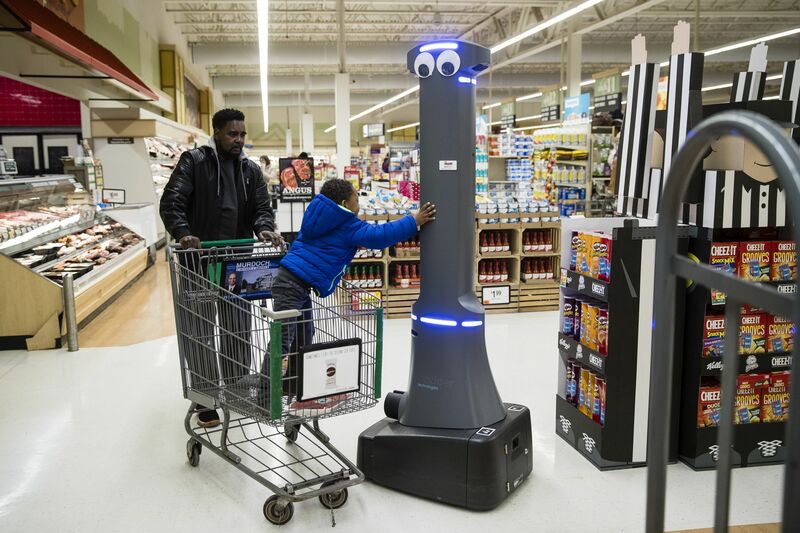 "The robots move around using laser-based 'lidar' sensors and pause when shoppers and their carts veer into their path." "The googly eyes are fake, but each robot has eight cameras — some directed down at the floor and others that can see shelves. ... [T]he robots can eventually be repurposed to help monitor a store's inventory."